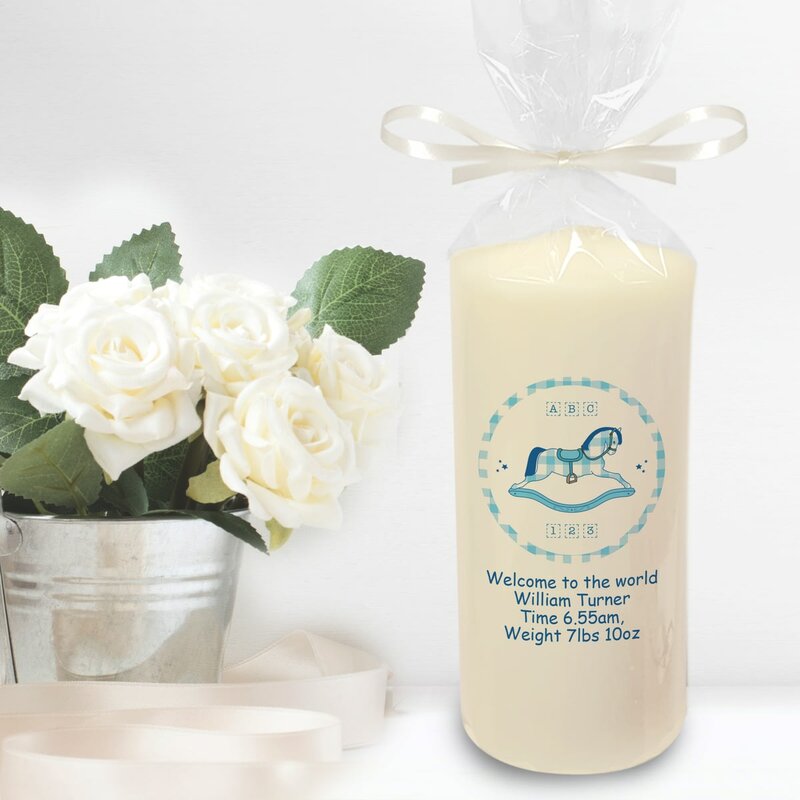 The birth of a baby boy needs something far more substantial than a standard birthday candle, this ivory candle is adorned with a blue rocking horse design which is very fitting for welcoming a special child into the world. 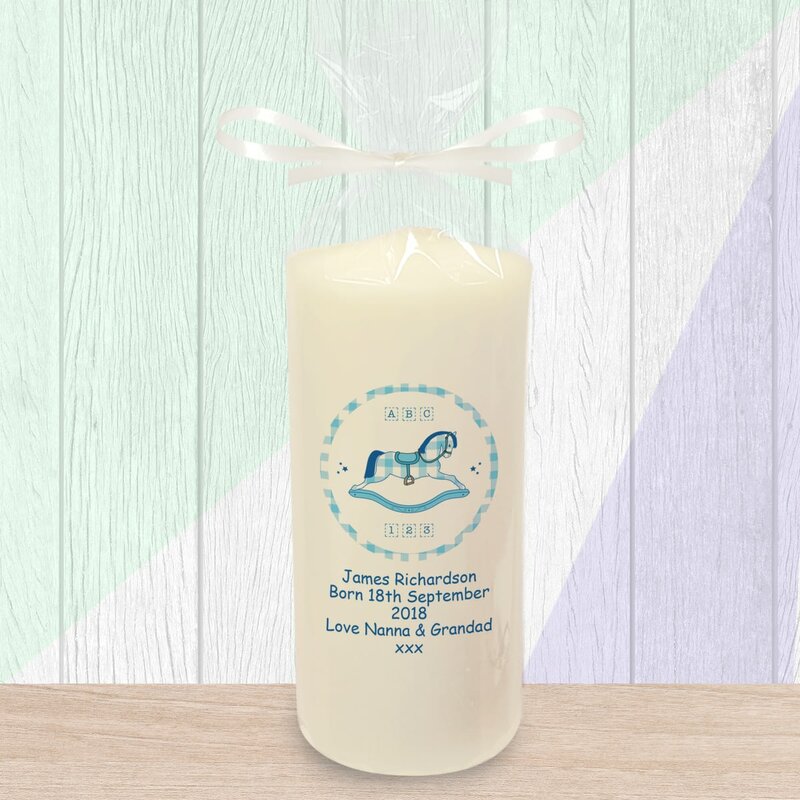 To make this candle even more special we personalise it with your heartfelt message and the name of the precious new arrival. The candle stands about 6" tall and is approx. It is presented in clear cellophane wrap and finished with a hand tied ribbon ready to present to new parents and their little bundle of joy. Whether the little one is an addition to your own family, or to a family close to you this commemorative candle makes a unique way to mark the occasion. Chilli and Bubbles have a new arrival and the little bundle of joy needs to be welcomed to the world. A sentimental poem adorns the front of this commemorative ceramic tea light holder. Your special message, made up of 4 lines of 25 characters, is incorporated underneath. Personalise with a special message over 4 lines of up to 20 characters below the Christmas themed design. Give the happy couple a gift to mark their anniversary. This ivory candle is fittingly decorated with lovely hearts and we also add a personal message from you.